A pair of gun-wielding robbers barged into a Brooklyn apartment building, whipped out their firearms and demanded two men hand over their property, police say. The frightening robbery unfolded Sept. 15 just before 6 a.m. in the vestibule of a building at St. Johns Place and Underhill Avenue in Prospect Heights and it was all caught on tape. Police say the two men wearing all black followed the two victims inside and forcibly took their jewelry and money from them and quickly fled the area. No injuries were reported. Video shows the robbery inside the building as the robbers take out their guns and point them at the victims. 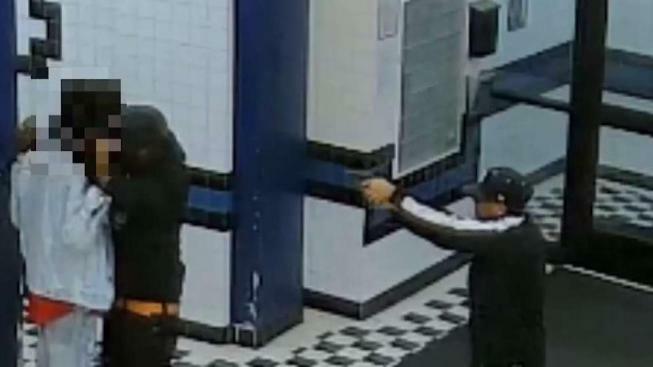 The duo police are seeking in connection with the robbery. No arrests have been made and the investigation is ongoing. Witnesses are urged to call Crime Stoppers with tips.